This article has been created to show you how to remove the .cerber6 file virus from your computer system and try to get back files encrypted with the .cerber6 extension. A ransomware virus, using the .cerber6 file extension which it adds to the files encrypted by it has been detected in the wild. 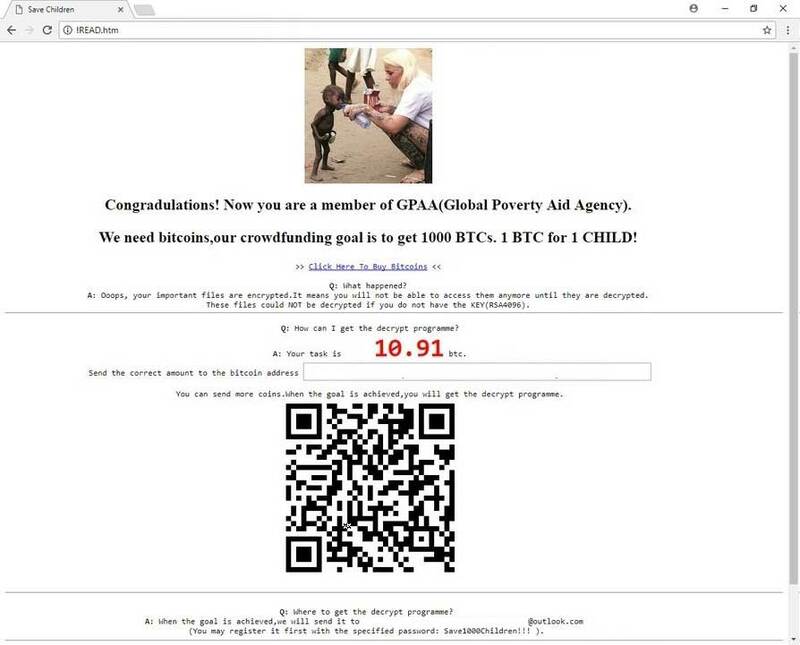 The virus claims to be GPAA (Global Poverty Aid Agency), however it may be nothing like it, because it extorts it’s victims for the humongous sum of 10.91 BTC. For this price, the cyber-criminals behind it promise to decrypt your files. If your computer has been infected by the .cerber6 file virus, we would recommend that you read this article. Short Description The .cerber6 infection encrypts the files on the compromised computer making them no longer able to be opened. Demands a ransom payoff of 10.91 BTC. Symptoms The .cerber6 file extension is added to the encrypted files. !READ.htm ransom note is added with a QR scan code. User Experience Join Our Forum to Discuss CERBER6. This type of ransomware virus is specifically designed to encrypt files. Given the high ransom demand which is the humongous 10.91 BTC, the virus is not joking around and the attackers have invested in multiple tools that may spread it. The primary method of infecting victim PCs with the .cerber6 ransomware is conducted via exploiting an unprotected RDP configuration. However, as reported by researchers this may not be the only way by which your computer may have been infected by this virus. But the virus may come onto your system via web-injectors as well. This means that It may also be spread via malicious web links that cause a redirect to the infection script. Such web links may be spammed as comments or exist in any other form online. >> Click Here To Buy Bitcoins << Q: What happened? A: Ooops, your inportant files are encrypted. lt weans you will not be able to access them anyeore until they are decrypted. These files could NOT be decrypted if you do not have the KEY (RSA4096).Q: How can I get the decrypt programme? A: Your task is 10.91 btc. Send the correct amount to the bitcoin address 19ZLfCEpxdskvWGLLhNUnM6dUG7yikhz2W You can send more coins. When the goal is achieved, you will get the decrypt programme.Q: Where to get the decrypt programme? A: When the goal is achieved, we will send it to [email protected] (You may register it first with the specified password: Save1000Children!!! ). Although it has not been confirmed as the latest variant of the notorious Cerber ransomware, this virus may use an encryption just as strong on your files. It’s primary end goal is to render the files no longer openable, but in the same time generate unique keys which are sent to the crooks and make them the only ones able to unlock your files. The virus also begins to pretend it is a charity agency, claiming it helps hungry children, but there is no way to confirm this. In any case, experts strongly advise against paying the ransom, because you may not get your files back and you support criminal activity. Before beginning the removal process of this ransomware virus, we urge you to backup your files, despite the fact that they are encrypted. Since the .cerber6 file virus is by far one of the worst type of threats you can encounter, it may create multiple different objects in critical for Windows places and files. Removing these files manually may eliminate the virus, but you also risk breaking your operating system. This is why, security experts recommend removing the .cerber6 file virus automatically with a ransomware-specific removal software that will scan for the malicious objects and eliminate them safely. At this point, there is no free decrypter for this ransomware virus. But we will track the situation and update as soon as there is one developed, so follow this blog post. Threats such as CERBER6 may be persistent. They tend to re-appear if not fully deleted. A malware removal tool like Combo Cleaner will help you to remove malicious programs, saving you the time and the struggle of tracking down numerous malicious files. Threats such as CERBER6 may be persistent on your system. They tend to re-appear if not fully deleted. A malware removal tool like SpyHunter will help you to remove malicious programs, saving you the time and the struggle of tracking down numerous malicious files. Note! Your computer system may be affected by CERBER6 and other threats. SpyHunter is a powerful malware removal tool designed to help users with in-depth system security analysis, detection and removal of threats such as CERBER6. 1. Install SpyHunter to scan for CERBER6 and remove them. 2. Scan with SpyHunter, Detect and Remove CERBER6. Ransomware infections and CERBER6 aim to encrypt your files using an encryption algorithm which may be very difficult to decrypt. This is why we have suggested several alternative methods that may help you go around direct decryption and try to restore your files. Bear in mind that these methods may not be 100% effective but may also help you a little or a lot in different situations. Note! Your computer system may be affected by CERBER6 or other threats. Remove CERBER6 by cleaning your Browser and Registry. Fix registry entries created by CERBER6 on your PC. Combo Cleaner is a powerful malware removal tool designed to help users with in-depth system security analysis, detection and removal of threats such as CERBER6. Step 5: In the Applications menu, look for any suspicious app or an app with a name, similar or identical to CERBER6. If you find it, right-click on the app and select “Move to Trash”. Step 6: Select Accounts, after which click on the Login Items preference. Your Mac will then show you a list of items that start automatically when you log in. Look for any suspicious apps identical or similar to CERBER6. Check the app you want to stop from running automatically and then select on the Minus (“–“) icon to hide it. Remove CERBER6 – related extensions from your Mac’s browsers. A pop-up window will appear asking for confirmation to uninstall the extension. Select ‘Uninstall’ again, and the CERBER6 will be removed. When you are facing problems on your Mac as a result of unwanted scripts and programs such as CERBER6, the recommended way of eliminating the threat is by using an anti-malware program. Combo Cleaner offers advanced security features along with other modules that will improve your Mac’s security and protect it in the future. Hey !, I found this information for you: ".CERBER6 File Virus (GPAA) – Remove and Restore Files". Here is the website link: https://sensorstechforum.com/cerber6-file-virus-gpaa-remove-restore-files/. Thank you.